Tools and molds can be made from a variety of materials, but there are a lot of factors that go in to deciding which material will best fit your needs. Performance requirements, the number of parts needed, and surface quality standards all play a role in cost and complexity of tooling. That’s a lot of money to spend on tooling. What many people don’t realize though, is that there is an overall, lower cost process for limited-run, elevated temperature tooling: High-temperature, high-density epoxy-urethane foam. Historically, there is a stigma about using foam for tooling due to potential cure inhibition. This is usually due to thermal conductivity issues rather than surface chemistry, but can be overcome by a properly designed cure cycle. These concerns are understandable because up until a few years ago, most urethanes were designed only for use at less than 250° F. Thanks to today’s technology, however, that is no longer the case. *Using large monolithic foam models and tools require special cooling procedures to prevent cracking or warping. Please consult with your General Plastics sales person for more information. 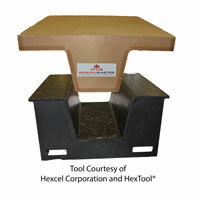 So next time you’re purchasing tooling material, consider a high-temp tooling board. If you want to save time, money, and effort long-term in your tooling process, then you can benefit from using a high-density, high-temp polyurethane foam solution. Interested in learning more? Check out this free recording of our Composites World Webinar. This informational presentation is hosted by our very own Senior Technical Director, Mitch Johnson, PhD, and will cover soft tool properties, density selection, tool preparation, and curing the tool.